Heaven, I’m in heaven. Designer heaven. 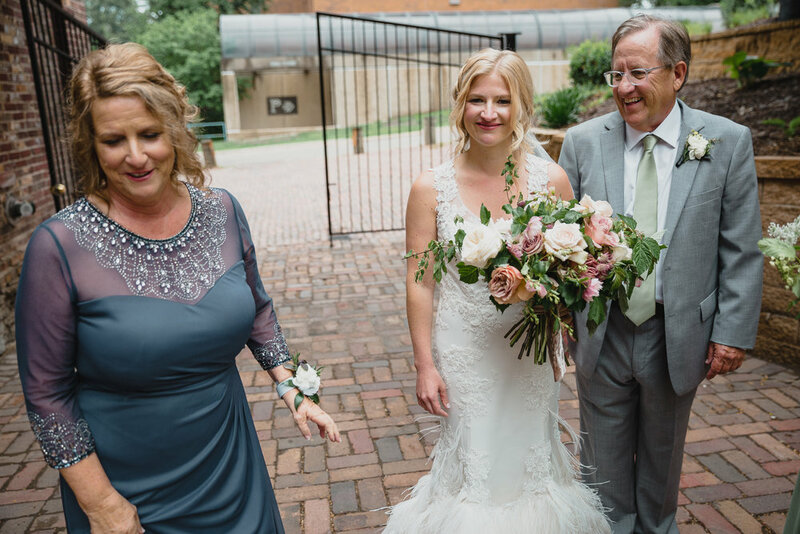 Gretchen and her mother Suzie twirled into the Modehaus Bridal Atelier back in 2017. They had the strongest vision for a custom wedding dress. Inspired by the film Top Hat from 1935 with Fred Astaire and Ginger Rogers. Gretchen fell in love with the flowing, feathery dress worn by Rogers in the iconic scene where the leading couple dances to the song Cheek to Cheek. We began designing a modern gown with the timeless influence of the ostrich feather dress. I draped a muslin pattern that I fitted to Gretchen. The muslin fittings gave us a good idea of the silhouette before any of the embellishments were added. She wanted a gown that hugged her figure while still giving her the room to dance her heart out! The greatest adventure designing this dress was the quest for the right embellishments. 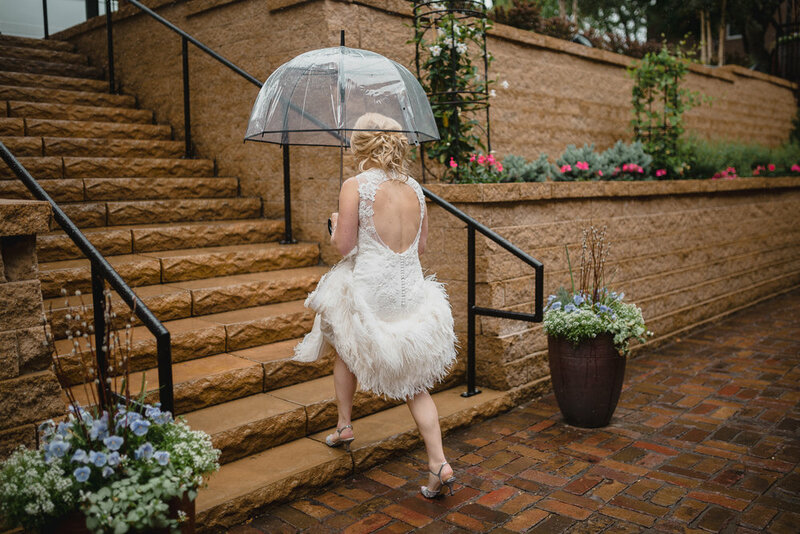 The ostrich feathers needed to be long and light enough to dance with our bride as she shimmied down the aisle. I traveled to New York City to find the perfect plumes for Gretchen’s dress. I found a family owned feather business in the heart of the Garment District. This 100 year old institution carries the most beautiful feathers. Walking into their shop was magical. Thousands and thousands of feather boas and bundles hanging from the ceiling. The co-owner, Jon, guided me through and helped me pick out the perfect ivory ostrich feathers for Gretchen’s custom gown. Learn more about Jon and Jay’s NYC feather house here in a July article from the Wall Street Journal. Suzie, Gretchen, and I had so much fun with every fitting choosing the silhouette, neckline, lace, and feathers. After the gown was fitted and assembled, I began hand stitching the feathers around the hem of the skirt. Row by row, they added this glamorous and ethereal movement to the gown. Once the feathers were on the gown, I strategically placed the lace applique. Balance is so important when you are adding embellishment to a gown. Not enough of it can make the dress look incomplete. On Gretchen’s gown, the lace had to visually stand as strong as the very eye grabbing feathers. I created a gradual transition between the two with overlapping lace and feathers trickling down the seams before it dramatically flares out into the skirt. We had such a blast over the months creating this gown together. GO TEAM! I mean, c'mon C&E?! These are bananas! 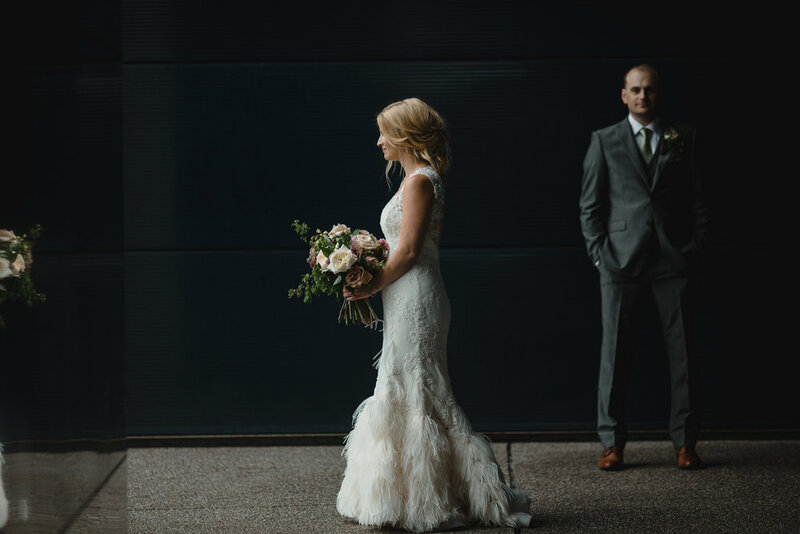 Gretchen and her fiance Jason were married at the Minneapolis Event Center. The ceremony and reception were beautiful! The modern rustic building was lit with warm light and gorgeous florals by Lilia Floral Boutique. The food was delicious and the bar was open! They did it!! And they danced cheek to cheek. Want to see more? Check out this film by Love Infinity.